The Digit-al Dozen DOES It All Again: Festiveness! Good morning, everyone! Have you been enjoying this “throwback” to old Digit-al Dozen themes? Have you entered our awesome giveaway for a $200 gift certificate to the polish etailer of your choice?! It’s day 4 and the theme is Festiveness. I had to go with Christmas festivities as I did back in December when we first visited this theme. Today, I’ve done a fuzzy Christmas tree! It’s completely impractical and would probably only last a day, but I love it! I applied my Duri Rejuvacote and let dry completely. Then, I made a V shape with some painters tape and made sure to smooth down the tape. I did a generous coat of China Glaze Starboard in the open V shape. While still wet, I carefully pulled back the tape to reveal a green triangle. I quickly dumped my green flocking powder over the wet polish and patted down. I then took some tiny star studs and applied them with some nail glue to the tops of the trees. If you are wondering, I found this green flocking powder with glitter in a Martha Stewart big pack of colors from Michaels art store. What do you think? I just felt like I couldn’t do Christmas trees without making them fuzzy! After telling my friend, Ashley is PolishAddicted, she made this funny pic for me! LOL Thanks Ash! Thanks so much for reading! Come back tomorrow to see the next throwback art theme! OMG LOVE!!! I love it so much. I need to do this when Christmas rolls around. SO cute! Great! I don't really like 'fuzz' on my nails – but in this design it really works and I would wear this – it would not bee too hard for those of us who are nail art challenged! I'm loving this so much! I can't wait for Christmas to come, haha. it looks amazing! Awesome idea! OMG this is tooooo freakin cuteee! This is do cute! I love the close up. Squee! Freakin' adorable! I love it! Beautiful and so original! Love how this came out. Perfect! And your macro pic is awesome too! I am going to remember these for the Holidays! Awesomeee! hairy trees – LOVE it!!! 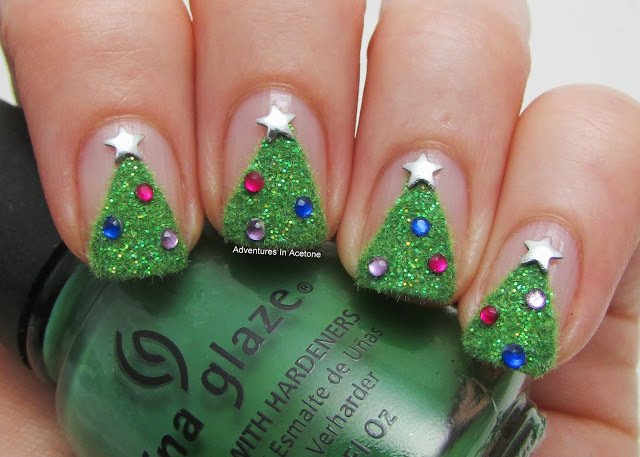 Well thats my christmas day mani sorted already!!!! 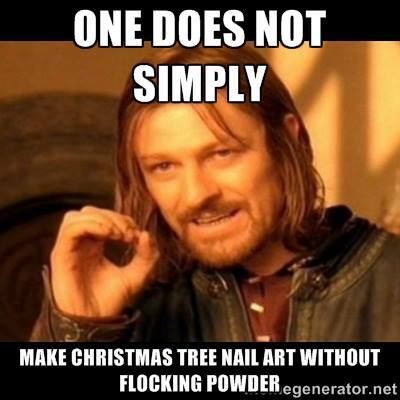 Love both the mani and the meme 😀 ! I think they are so funny and cute!